Gastric Sleeve Surgery is a weight loss programme that involves the surgery to manage and maintain rather than the gastric bypass method. The size of the stomach is minimized and made into the form of a tube. Since the person will get his stomach reduced he will need only a small amount of food a day. This results in the accumulation of fewer calories in the body thereby helping to lose weight. 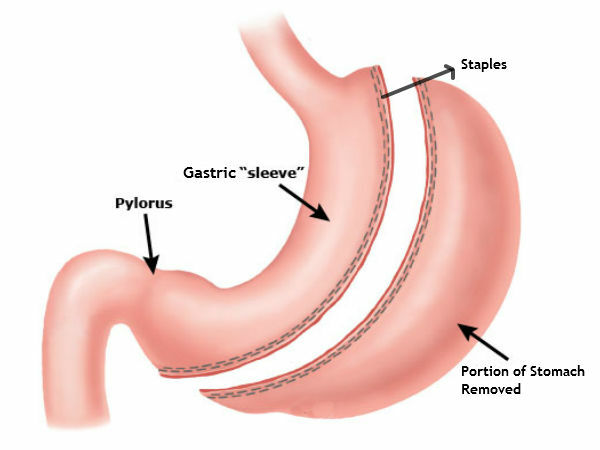 The surgery method of gastric sleeve involves both the advantages and disadvantages that get associated with it. So the person who wishes to undertake the surgery will have to take note of the pros and cons of the surgery. Below are the advantages and the disadvantages that are associated with doing this surgery. Some would prefer these kinds of surgeries for lose weight fast. Let’s see the pros first. This is the main advantage of the surgery. A person gets the satisfaction by eating small amount of food. This owes to two reasons. Primary reason is the fact that as the surgeon reduces the stomach, the hormones and the biological factors that are responsible for the sensation of hunger gets low. The second reason is that the people have a sense of satisfaction after the stomach becomes full. But after the undergoing of the surgery the space required for the food becomes small and so less amount of the food is needed. As a result, fewer calories gets built in the body and the apt weight is maintained. It is extensively useful if it is backed up by exercise and a healthy food regime. The weight loss also leads to the enhancement of blood pressure, low glucose level and fatty liver symptoms. This surgery is less invasive than the rest of the operations. It has no cutting and does no changes to the small intestines. So the complications that arise due to the surgery are minimized. The assimilation of the nutrients by the intestines is also minimized as the intestines are not changed. This surgery involves no restrictions in diets and the patients are allowed to eat and drink whatever they desire. The surgery makes the outlet valve of the stomach intact. It is different from the other forms of the operations. The Dumping syndrome means that the food travels through the stomach unaltered by the gastric juice. It results in indigestion, diarrhea and pain. The foreign bodies do not get into the body of the person undergoing the operation. So the chances of getting infected are less than the other modes of operation. Laparoscopy is used to effectively perform the operation on the fat people. In some cases the gastric sleeve operation fails to get the desired effects. In that case another surgery is performed on the patients. It is known as gastric bypass. The gastric sleeve surgery contains cons that are very effective than the advantages. This procedure is irreversible. This is the most noted disadvantage. The effects of the surgery are permanent and a tiny pouch is kept at its place. The stomach becomes very sensitive to improperly chewed food and food eaten in haste. So the people have to learn to eat slower. The patients even after the operation try to eat the same amount of food as usual. There has been found no method to prevent the stomach from overloading. When the same amount of food is eaten it results in the enlarging of the stomach. This paves the way for the more amount of food to be consumed. As a result the calorie and the weight increase. The liquid intake is not limited and so high calorie drinks may increase the weight of the patient. The humans lose hair in the average of about 100 strands a day. During the weight loss programs the hair of a person falls tremendously. At the time of nearing the target the falling of the hair will slow down. It does not occur in all the patients. These can be often found in the people who have undergone the gastric sleeve surgery. The patients will experience this for about seven months after the operation. As the people will drink only liquids before the operation they will have the tendency to urinate often. With the advancement of time the problem minimizes. It can be treated with the medications. It results if the people eat their food fast and drinking water while chewing the food. The problem diminishes as a result of the people becoming accustomed to the condition. So to counteract this issue the patients must eat their food slowly. It is a result of nausea and trying new foods. If the problem persists it is advisable to change to the fluid foods for a day until the start of solid foods. It can also be a serious issue that needs the attention of the doctor. The gastric sleeve has many risks. The other complications include pneumonia, pain, blood clots and infections. In some leakages occur and can damage the internal organs and thus results in the infections. It is commonly found in obese patients. As the procedure is relatively novice, it only has a small medical record and the long term effects are not recorded.